There’s a great piece in Black Girl Dangerous today about femme clothing, gender expression and identity. In their article, non-binary femme author Jack Qu’emi Gutiérrez talks about Jaden Smith’s appearance in a womenswear campaign making the news, and explains that unless he states otherwise, Jaden is still a young cisgender man. He should be celebrated for showing that it’s OK for men – especially black men – to express femininity, but he’s not a “non-binary icon,” and he’s not mocking or taking anything away from trans people. I’ve posted about this subject before, and agree with the author’s assessment. People of all genders – as well as agender people like myself – should be free to present themselves in whatever way feels comfortable and appropriate for them, without being hemmed in by binary gender assumptions. 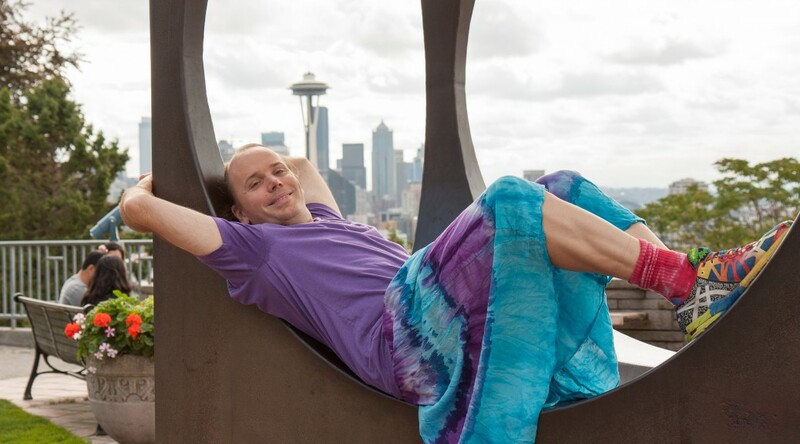 A male-assigned person wearing a skirt is not necessarily making a statement about their gender identity or sexual orientation. It is only because of our patriarchal society that casts masculinity and heterosexuality as the default that a man wearing a skirt is a more transgressive act than a woman wearing pants. When I met my partner Ziggy, pictured at the top of this post, we were in those roles; I was living (pre-transition) as a woman, fairly ignorant about gender issues, who strongly preferred wearing pants, and he was living as a man who strongly preferred wearing skirts. I’ll admit that his skirt-wearing really bothered me at first, as I was prejudiced against femme presentations. But love conquers all, as they say, and soon his clothing was no more remarkable to me than any other man’s, even though I hardly ever saw another man wearing a skirt (even in the San Francisco Bay Area). I’ve since transitioned to male, and Ziggy now identifies as genderqueer but cissexual; he has no desire to go through a physical gender transition. Our subconscious sexes are both male, independent of the clothes we wear or the pronouns we prefer (Ziggy still uses he/him/his; I prefer they/them/their for myself). While Ziggy has been fortunate not to experience much harassment for his clothing choices, others have not been so lucky. Agender teen Sasha Fleischman had their skirt set on fire by another teenager who thought Sasha was a gay man. Other trans and non-binary people have told stories of what they wanted to wear but did not for fear of violence. If anyone can wear skirts, what are the implications for male-assigned, femme-presenting people who actually are women? Trans women get the worst of gender policing; if they present as femme, they’re accused of parodying women, but if they present as masculine or androgynous (which in our patriarchal society is basically masculine), they are seen as men and treated accordingly. My advice is to always assume that an individual knows their own gender better than you do. In other words, if someone is walking into a women’s restroom, assume that they belong there. If you misgender someone and they correct you, apologize and move on. Use gender-neutral language whenever possible. And stop using biological essentialism to justify bigotry. Skirts are just fabric. Clothing has no gender. Celebrate diversity. Addendum: Just after publishing this article, I read about the death of David Bowie, another gender “transgressor”. Check out this article by another non-binary blogger on Bowie’s legacy.